You are currently browsing the archive for the Marlborough category. The trail to the wetlands picnic area at Grove Mill Winery. Photo by David Lansing. An epic day yesterday. After tasting something like 36 wines at six different Marlborough wineries I ended up the afternoon at Grove Mill, the first winery in the world to achieve CarbonNZero certification. Which basically means that they are so friggin’ green that their operations have zero impact on carbon dioxide emissions from energy (and that includes the distribution of its wine). Roger Kerrison, the guy at Grove Mill largely responsible for this accomplishment, offered to take me around and show me what they did to be such good citizens of the planet, but after having spent two weeks visiting maybe 40 wineries around here, I told him I pretty much felt like I’d been there, done that (how many times can you listen to a spiel on the fermentation process?). Which, I think, was fine with Roger. So since it was such a gorgeous afternoon, with those famous long white clouds gliding high over the Waihopai Valley, Roger rounded up Grove Mill’s young winemaker, David Pearce (I’m just starting to realize that almost all the men in New Zealand are named David for some reason; not that I mind. I think it’s a lovely name), and the three of us tromped off to the picnic grounds in the middle of the winery’s restored wetlands with Roger hauling six bottles of wine in something that looked like what milkmen once used to deliver bottles of milk to your home when that still happened, and David carrying a few more bottles in his hands. 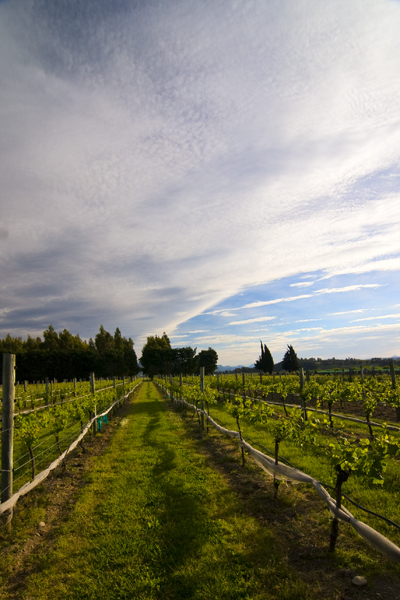 The epic sky above Grove Mill vineyards. Photo by David Lansing. We sat on the grass and talked about trout fishing (David is a keen fisherman) and how Roger, who is from the UK, ended up working in a New Zealand winery. Long story short: Roger came over from England five years ago for a friend’s wedding and ended up buying so many great Marlborough wines that he basically spent his airfare home. “Truth is, I got stuck here,” he said. 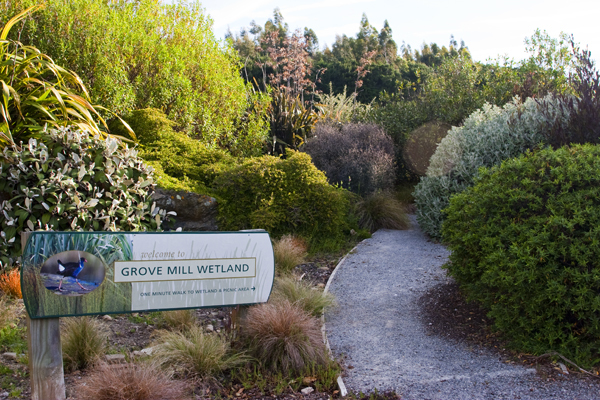 We tasted Grove Mill’s Sauvignon Blanc, the world’s first carbon zero certified wine, which David proclaimed had a certain “salt marsh characteristic to it” (I think this was the wine talking), as well as the Pinot Gris and the Riesling and…well, we sampled all of them. And we stopped talking about how minerally they were or whether there was a little fig taste in the Chardonnay (I swore there was) and instead took off our shoes and lay on our backs on the cool grass and talked about fly-fishing, cooking (David Pearce collects cookbooks), the Southern Bell frogs that were croaking all around us in the wetlands, and the best live concerts of all time (I just don’t understand when people bring up the Grateful Dead). In other words, we drank some good wine and just enjoyed ourselves. Until the pale blue sky started to turn orange and purple, the shadows grew long, and it was time for me to walk (thankfully) down the road to my B&B. As I said: An epic day. Tomorrow it’s on to New Zealand’s North Island. Some tricks of the trade for growing grapes at Seresin Estate. Photo by David Lansing. The Vatican of biodynamic viticulture in New Zealand has to be Seresin Estate where I spent yesterday afternoon. It is owned by Michael Seresin, a Wellington lad who moved to Italy in the 60s and became a cinematographer (“Midnight Express,” “Angela’s Ashes,” “Harry Potter and the Prisoner of Azkaban”). The life as an ex-pat in Italy is important in this story because when Michael started Seresin Estate in 1992, he wasn’t just interested in growing grapes and owning a winery—he wanted that whole Italian grow-olive trees-fruit trees-organic-vegetable-gardens thing. And since he has been a vegetarian and, as he says, “organically inclined,” most of his life, it made total sense to establish an estate that not only grew grapes and Tuscan olive trees but used chickens for pest control and compost for fertilizer. Well, okay, I’m on board for all of that. But then we had a look at the biodynamic part of the business and that’s where they lost me. We started at a little compound by the chicken roosts. A number of brick-lined pits had been dug into the ground. Some were covered in burlap, others were open. Above one was a chicken wire-lined crate, about two-by-two-by-two, filled with thousands of broken brown organic chicken eggs that could be lowered into the pit. 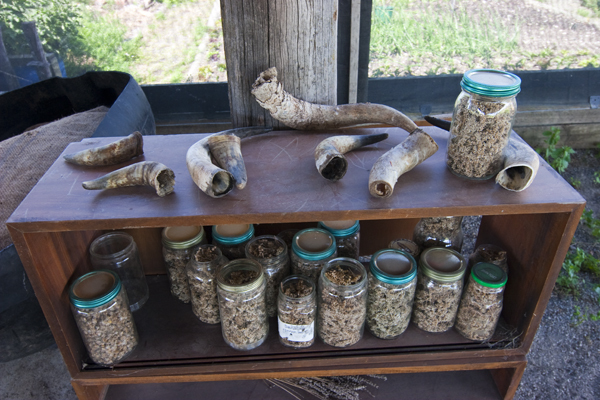 On a nearby table were a dozen cow horns and a makeshift bookcase held dozens of quart-size Mason jars full of dried herbs: camomile, yarrow, dandelion flowers, stinging nettle. Colin explained to me how the herbs were dumped into the various pits where they would ferment and get yucky (between the chicken coops and the fermenting pits, the compound smelled horrible in the heat) and eventually be stuffed into the deer bladders that, looking like used inflated condoms, were hanging on some twine in the shade, or the cow horns. Eventually we made our way into the building where the wine is made only now the tanks were filled with this rather stinky composting tea made from all of these strange ingredients. “Of course, when we get done fermenting the compost tea, we have to thoroughly clean the tanks before we pump in the grape juice,” Colin said. I don’t know. There are so many strange things that humans do so if Michael Seresin thinks he’s going to get better wine by fermenting yarrow and stuffing the dregs into a deer bladder that is then used like some sort of foul tea bag to make some sort of nasty concoction that he then spreads on his vines to make them grow better grapes (and keep the buggies away), well, who am I to say he’s crazy. After all, I grew up convinced that a man named Jonah lived inside a whale for three days and that if you didn’t eat meat on Fridays, you’d go to heaven. So I say What the hell—go ahead and bury your cow manure-stuffed horns in the vineyards if it makes you feel better. A NZ winery dries deer bladders which will be used to ferment yarrow for a compost tea. 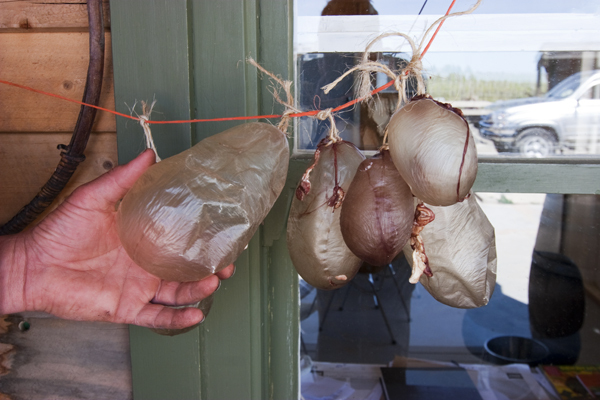 Why do you need deer bladders to grow grapes? For the same reason Mormons won't go to heaven unless they wear the proper underwear, of course. Photo by David Lansing. 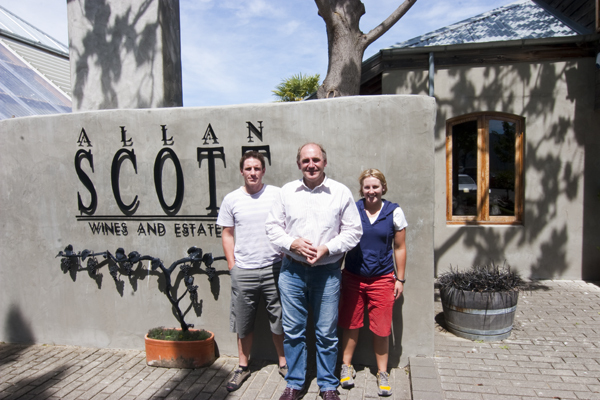 I mentioned yesterday how the Allan Scott winery in Marlborough, New Zealand, has at least one vineyard plot where they’re using biodynamic viticulture practices. I could easily spend a week writing about what, exactly, these practices are, but who wants to read about that? So let’s keep it simple. I’m probably going to get some flack for saying this, but I think of biodynamics as being the Scientology of viticulture. It’s pretty wacky. Preparation 500: Take cow manure, ferment it in a cow horn, and then bury it in a row of vines and let it overwinter in the soil. Preparation 501: Take ground silica (sand) and mix it with rain water and pack that in a cow’s horn, bury it in the spring, and then dig it up in the autumn and spray the sludge on the vines. Preparation 502: Harvest the flower heads of yarrow and ferment them in a deer’s bladder, and then use this to make a compost tea that contains fermented camomile flowers, stinging nettle tea, oak bark fermented in the skull of a domestic animal (like a goat), dandelion flowers fermented in cow mesentery (which are the gooey membranes and tissue around abdominal organs), and the pulp from valerian flowers. Okay, I made that last part up. But not the rest of it. Actually, I think singing “Candy Man” would be better for your grapes than spraying them with gooey cow intestine, but then again, I’m not a true believer. When I parked in front of the Allan Scott winery yesterday there was only one other car in the gravel lot; a dirty gray Suzuki with a personalized plate that read 1NDULG. And then on a concrete wall separating the lot from the wineries restaurant, Twelve Trees, was the word ENJOY in foot-high letters. The gods—or maybe the Scotts—were trying to tell me something. So I did both: indulge and enjoy. Not only is Catherine in charge of the tasting room, or cellar door as they call it here, but the restaurant where I was to have lunch. She also does most of the bookkeeping. Anyway, Allan was found somewhere in the winery and soon showed up along with son Josh who, in addition to being a winemaker at the winery, owns a boutique brewery, Moa, where he makes a bottle-fermented beer (it seems to me that the one thing almost all winemakers have in common is a love of beer). Another daughter, Sara, who has been pushing her dad towards organic growing, also showed up midway through our lunch. Josh and Sara apologized for being a little grungy. “We’re both training for an upcoming triathlon,” Josh said (he also plays on a local rugby team). Josh, Allan, and Sara Scott. Photo by David Lansing. I asked them if they grew up around here. “On the farm right across the street,” Josh said. I always think of a farm as being, well, you know, a farm, but to most winemakers that’s also what a vineyard is—a farm. And that’s what Josh meant when he said he and his sisters (the eldest sister, Victoria, who does the winery’s marketing, was off in New York) grew up on the farm across the street. Just as we were finishing up our soup, Catherine came out. “How was the chowder?” she asked. The Scotts bottle several different Sauvignon Blanc wines but the one we’d been tasting with Catherine’s chowder is called Millstone and comes from a vineyard that has been transformed to a total organic culture in which the vines are cultivated using biodynamic principles where chemical fertilizers are replaced with compost teas and other homeopathic preparations (some of which can be a bit bizarre; more on that at another time). Anyway, the Millstone vineyard is a bit of an experimental plot but if things go well, the rest of the Scott wineyards may follow. Wouldn’t that be nice. It’s not easy to get to the Bay of Many Coves Resort in Queen Charlotte Sound. It’s not accessible by road. So what you have to do is take a water taxi from Picton along Queen Charlotte Sound, passing by any number of sail boats, kayakers, a barge or two (one I passed was carrying a fresh load of salmon—about 50 tons worth according to the young water taxi skipper), and, if you’re lucky, maybe several pods of dolphins, until you come around a bend, the boat slows, and there before you, nestled among a thick native forest, are a dozen small buildings peaking out from the trees. This is the resort, which was built in 2003. As it happened, I managed to catch the very last water taxi at 6 yesterday evening and by the time I arrived at the resort and checked in, the sun had set and it was surprisingly dark out with the only lights at the resort coming from the little orange path lights spaced alongside the hill. Before dinner at the resort’s Foredeck Restaurant, with a stunning view overlooking the Sound, I pulled up a chair at the bar and asked the bartender, an attractive young woman with bright streaks of red in her otherwise black hair, if they had a house cocktail. I didn’t even ask her what was in it—I just ordered it. It was a fascinating drink. I didn’t get the connection to a Cosmopolitan. To me, it tasted more like a margarita martini, if that’s possible. I sat there as the moon rose over the Sound, throwing a shimmering silver blanket over the water, trying to break down the ingredients. As I’ve said before, I don’t have the greatest palate. There was gin in it, for sure, and citrus elements—Cointreau, I was guessing since it was based on a Cosmopolitan. But there was something else I just couldn’t put my finger on so I asked the bartender what the secret ingredient was. Geoff returned to New Zealand with his Antipodean accent and embarked on a mission to create the world’s freshest, most pert gin. He wanted something young, with a twist that had roots established firmly in New Zealand. Two years later, he opened the first bottle of South, and it’s now one of the premium gins in the world. 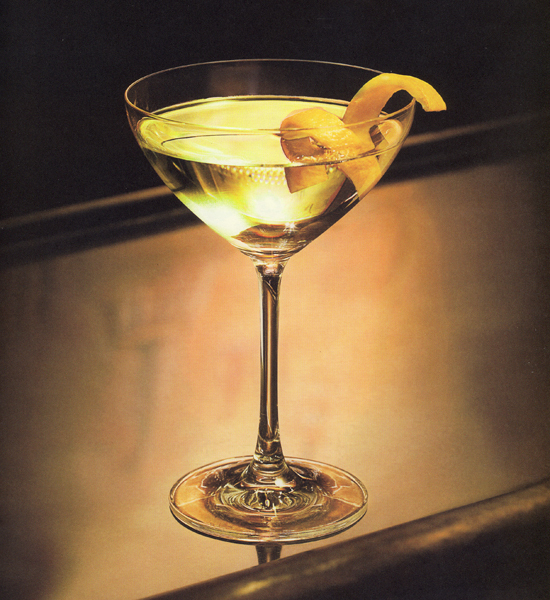 So, you could make your Marlboroughpolitan with some other gin—but I wouldn’t. Add ingredients to a shaker half filled with crushed ice, shake well, pour into a martini glass and top with sparkling white grape juice (or, if you prefer, as I do, with sparkling wine). Garnish with a lemon twist.